Aan De Oever Guest House is one of the most popular Guest Houses in Swellendam. We are privileged to enjoy the beauty of nature every day and we are lucky to be able to work in such an incredible environment. We want all our guests to feel welcome and we strive to make their stay in our beautiful town a memorable experience. One of the major contributions to our incredible success is our staff. They are strong, hardworking and driven people and will go out of their way to make the guests feel at home. As a company, we are extremely lucky and grateful to have such an awesome team to help ensure that everything runs smoothly every day. 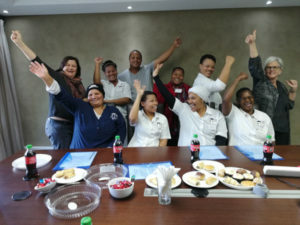 In the month of June we all had the wonderful opportunity to attend a teambuilding workshop presented by Mrs Suzann Swart. Throughout this workshop our staff, were given the opportunity to learn more about themselves and their fellow team members. They were asked to fill in a few questionaries’ about themselves and how they usually react in a specific situation in order to establish what type of person you are and how others see you in and around your workplace. The main goal we wanted to achieve was to identify the different types of people we have in our wonderful team and to help everybody understand why certain people react in certain ways. This workshop helped them to realize how they should react in certain cases and also how they should handle their fellow teammates. They learned the importance of respecting one another and how to communicate to others so that both party’s reach a win-win conclusion. The workshop was a huge success and the team enjoyed attending the meetings in the conference room at our Boshoff Visser Head Office. The highlight for them was the part where they learned new things from each other and that every individual understands their importance in and to the team. They feel more positive about each other and now know how it feels to walk in another man’s shoes. The company is filled with high hopes and confidence preparing for the coming season. A lot of new adventures await and we are happy and excited to tackle each obstacle together to achieve success.